Cottonwood Canyon holds an interesting site on its western slopes, a site known as the Moorten Mill. There's not much left there to see, and the historical information available for snoopers like me is even scantier. But I'll share what I was able to find, along with some speculation and questions. Concrete foundation for the Moorten Mill, looking south down the canyon. An historic resource study done on J Tree relates that during the 1930s, Chester Moorten (sometimes seen in print as Morton or Morten) erected a five-stamp mill on the western side of Cottonwood Canyon. The mill sat atop a concrete slab on a small rise reinforced with stone walls. A road led from the canyon up to the mill. The five stamps reportedly each weighed 200 pounds. Moorten lived nearby and also had filed on several mining claims in the vicinity. He had first arrived in the area around March of 1934. In addition to treating the ore from his claims, the mill also did custom work for some of the other nearby mines. Moorten closed the mill operation towards the end of 1939, although he keep up his mining activities going until 1950. There's not much to see at the mill site, other than the concrete slab that once provided the foundation for the mill, the stone retaining walls, and four sheet-metal vats. 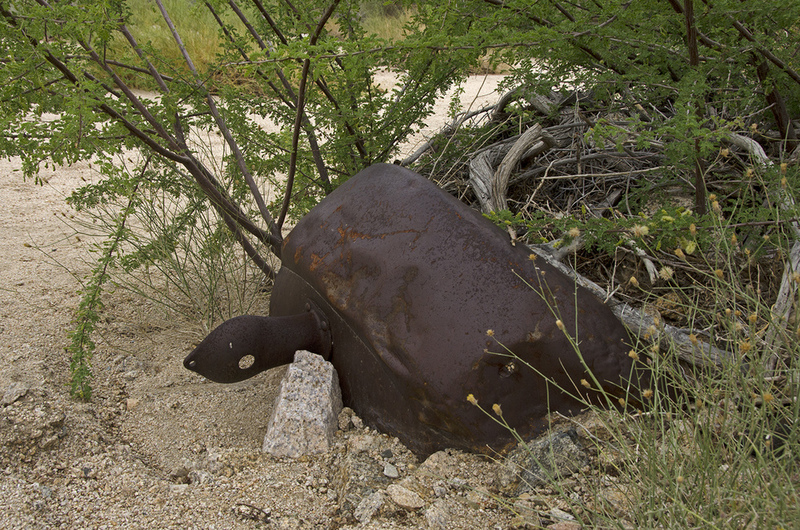 Some other bits and pieces of desert gold are scattered about the area, as well as the rusting remains of an old car. This one has been picked pretty clean. That's the "firm" information regarding Chester and the Moorten Mill. Here's where the story gets interesting. 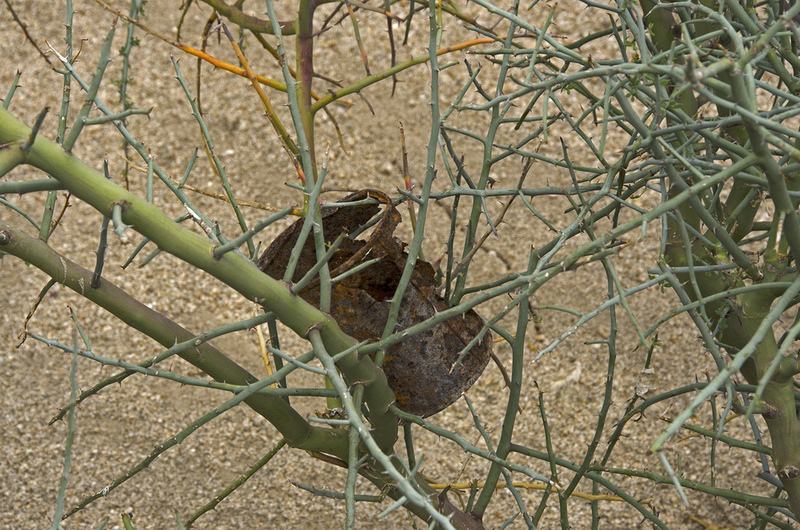 Elsewhere in the historic resource study, there is a reference to a "Cactus Slim" Moorten. Which brings a question: Is the Chester Moorten of Joshua Tree and Moorten Mill the same Chester "Cactus Slim" Moorten of the Moorten Botanical Garden in Palm Springs? The same Cactus Slim who was one of the original Keystone Cops in silent movies? The same Moorten who was friends with Walt Disney and helped design the western theme of Disney's Frontierland? I think so, the timing seems to fit. 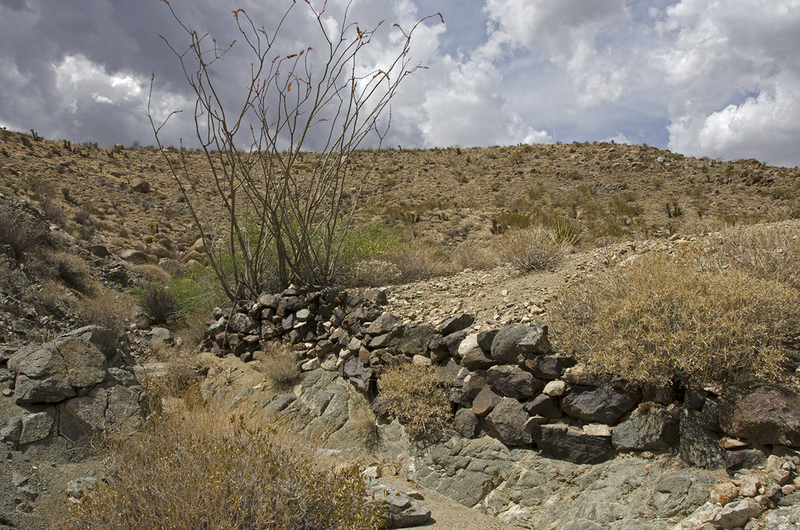 One source states that Chester moved to the Cottonwood Springs area in 1930 to pursue mining interests, and then later began collecting and raising cacti. Another source states that Chester and his wife Patricia left Hollywood for health reasons in the early 1930s. They settled in the Palm Springs area and opened a nursery, which eventually became the now famous Moorten Botanical Garden. I'm going to say it's the same man. You never know what, or who, you're going to find in Joshua Tree National Park.